The River Lagan rises on the northern slopes of Slieve Croob. 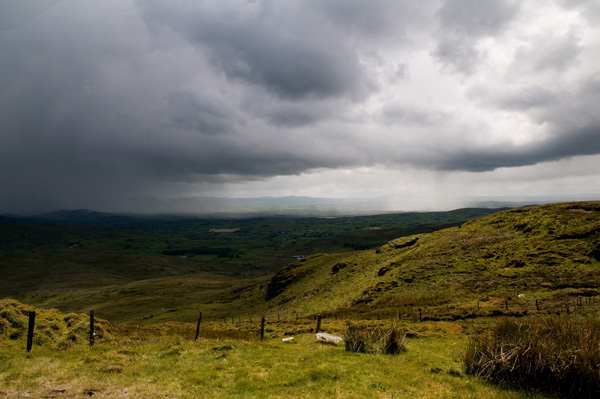 The three parishes of Magherahamlet, Kilmegan and Drumgooland converge on the summit, which has excellent panoramic views, including a particularly fine view of the northern peaks in the Mourne Mountains. Until the mid-20th century, there was a tradition of climbing the mountain on Blaeberry Sunday at the end of July or beginning of August. This is clearly a survival of a Lughnasa tradition [see MacNeill, 155-56]. The summit cairn is locally known as the Twelve Cairns, but this seems to be a relatively modern name arising from damage causing the break-up of a single cairn into several smaller heaps. Slieve Croob is the 462nd highest place in Ireland. Slieve Croob is the most northerly summit in the Mourne Mountains area.